Call today to talk with an insurance dispute attorney! Robin A. Blanton, a third generation Floridian, has been a civil trial lawyer in Vero Beach, FL for over thirty years. He has enjoyed law practice both as a founding member of a large law firm as well as a single practitioner. Since 2004, Blanton has practiced law in his own law firm, Robin A. Blanton, P.A. Mr. Blanton's civil trial practice includes injury and wrongful death claims, business/commercial litigation, and products liability. He is also an insurance dispute attorney as well as a business disputes attorney. Blanton enjoys an AV rating with Martindale-Hubbell. If you are looking for an accident attorney, call Robin A. Blanton today. Call an experienced business disputes attorney! 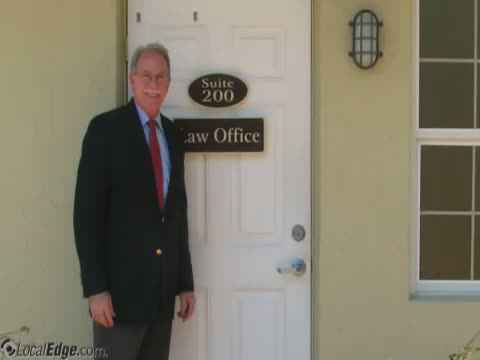 Mr. Blanton is a Florida Bar Board Certified Civil Trial Lawyer since 1988. He is a member and past President of the Palm Beach Chapter of the American Board of Trial Advocates. This is an invitation only organization of experienced jury trial lawyers who have demonstrated exceptional litigation skills. He is also a Charter Fellow of the Litigation Counsel of America. Mr. Blanton received his undergraduate degree from Stetson University in 1973 and his law degree from Stetson University College of Law in 1977. As a business disputes attorney, Mr. Blanton understands the need for swift, effective service in order to help clients resolve problems as quickly and discreetly as possible. Call today and let Mr. Blanton help you maintain momentum toward meeting your business objectives. Many businesses have disputes with customers, business partners, or employees. Our business disputes attorney can help you with problems arising from a misunderstanding, ambiguous contract, or a disagreement with your business partner in the Vero Beach, FL area. He is admitted to the Florida Bar, the trial bar of the United States Southern District of Florida, the United States District Court of Florida - Middle District, the United States Circuit Court of Appeal for the Eleventh Circuit, and the United States Supreme Court. Blanton has served both local and state bar associations and is a past President of the Indian River County Bar Association. He has been a member of the Grievance committee for the 19th Jucidicial Circuit, and he has been a recipient of the Pro Bono Service Award for Indian River County. He has served as a member of the Florida Bar Association's Committee on Professionalism. Mr. Blanton is also committed to serving the community through his civic associations. He serves on the Board of Directors for the Visiting Nurse Association of the Treasure Coast and has served as past Chairman of that board. The Law Offices of Robin A. Blanton, P.A. are located at 1201 19th Place, Suite B200 in Vero Beach, Florida. They can be reached during regular business hours at 772-794-1266. When it comes to an experienced accident attorney, Robin Blanton has over 30 years experience as a respected civil trial attorney. If you have had the misfortune of being seriously injured in an automobile accident or by a defective product, then we welcome your call. Get help claiming the compensation you deserve and call today. Consult our accident attorney about any questions you might have about your legal rights following a crash. We are committed to helping car accident victims understand these rights and how they may be able to obtain compensation to cover damages such as medical bills and lost wages. Depending on the details of your crash, you may be able to seek compensation through insurance claims or a lawsuit against a negligent driver. If you or a loved one has been hurt in Vero Beach, FL, find out how our accident attorney could help. Mr. Blanton is also experienced as a business disputes attorney. Business disputes happen. Disagreements arise any number of ways within business relationships, and if you need legal representation, then please call our law office today. We are committed to helping you solve the most complex of disputes involving contracts, fiduciary duties and other business issues. If you find yourself in need of a business disputes attorney, remember Robin A. Blanton. Our insurance dispute attorney can assist you with your case. If you are facing issues with your insurance company, you don't have to struggle by dealing with the problems yourself. We offer affordable legal solutions for clients in Vero Beach, FL and the surrounding areas. Mr. Blanton practices insurance law, business law, auto accident law, and more. If you want to discuss your case, contact our insurance dispute attorney today to schedule a consultation. Mr. Blanton has been serving Vero Beach, FL for many years. He has 30+ years of experience being an insurance dispute attorney and representing both insurer and insured in resolving disagreements over insurance claims. He also is experienced in playing the role of a business disputes attorney and an accident attorney. For more information on the services he offers, please call today. The Law Offices of Robin A. Blanton, P.A. Serving the residents of the State of Florida's 19th Judicial Circuit which encompasses Indian River County, St. Lucie County, Martin County and Okechobee County. Florida Bar Board Certified Civil Trial Lawyer since 1988. Robin A Blanton, P.A. 's Civil Trial Practice includes injury and wrongful death claims, business and commercial litigation, products liability and insurance coverage disputes.